I expected Tolino Page to challenge the Kindle Basic. Instead, I found myself frustrated and disappointed with the device. There is a lot to like about the Tolino Page, but software failings outweigh the positives. I will split the review between the positives and, more importantly, the negatives. Apart from Amazon, Tolino is the only other major vendor that offers extensive features to manage personal documents. Kobo recently acquired Tolino but considering the slow momentum of e-reader software development, I doubt Kobo will implement Tolino’s cloud features any time soon. Technically, utilising Tolino’s web services requires an account with an e-book store located in one of Tolino’s supported countries. Nonetheless, there is a work around to use the online services in any location. 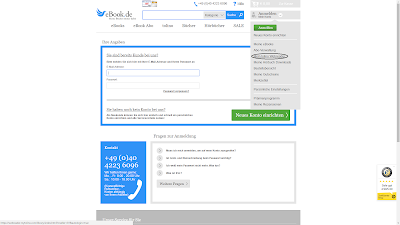 First, register an account with the e-book store thalia.de (there are other e-book stores supported). 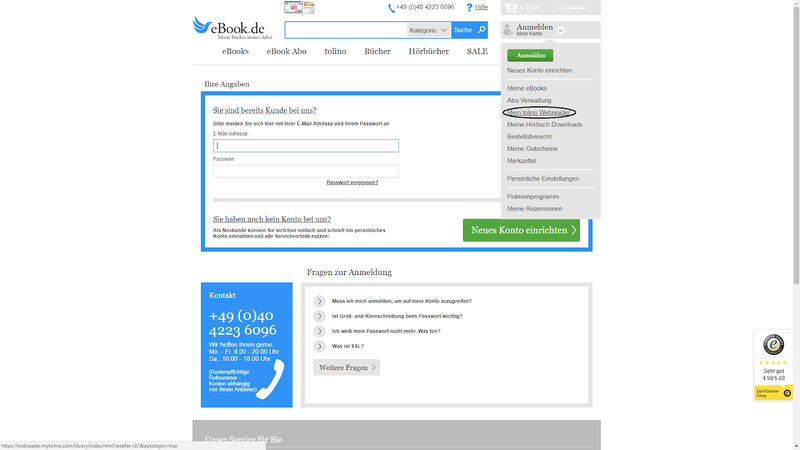 After creating an account with thalia.de, register a Tolino Cloud account via eBook.de (see below to identify the right section). After logging-on to a Tolino account, it is possible to set the interface language to Dutch, English, French, Italian and Spanish. Importantly, in account settings link the Tolino account to thalia.de. After linking Tolino Cloud/web reader to thalia.de, it is possible to register any Tolino e-reader through thalia.de and access uploaded personal documents. Through the Tolino Cloud, it is possible to categorise uploaded personal documents in collections. Once uploaded, an e-book can be read directly in the web browser, Tolino's Android/iOS application or with a Tolino e-reader. Further, current page location and annotations are synchronised across devices. While there is no way to export annotations via the web browser or Tolino's Android/iOS application, there is the option to access annotations via a text file stored locally on a Tolino e-reader. Regrettably, the stored annotations are only those made on the e-reader. Cloud support makes managing an online library so much easier. For example, factory re-set a Tolino device and in a few minutes, you are ready to go again. The library can be managed online without any need to side load documents, and with page location and annotations backed-up from your last online synchronisation. While Amazon’s synchronisation across devices works better, Tolino’s online document management is more intuitive and with superior features. For example, it is possible to upload e-book cover images, add/delete documents and organise e-books in collections. In contrast, with Amazon’s online content management, it is possible to delete archived documents but there is no way to manage collections. Kobo and Barnes & Noble, on the other hand, do not support cloud synchronisation and management for personal documents. Tolino also supports the side loading of fonts and I found side loaded fonts render well. In contrast, Amazon does not support the feature at all. Highlighting is not smooth or accurate and it is not possible to continue highlighting a text if it extends to the next page of an e-book. Strangely, and this seems to be a software bug, turning a page can result in text appearing de-focused. Re-focusing the text requires a few seconds, after instigating a full-page refresh (when this occurs there is a prompt to turn two or four pages back). The problem is frequent and annoying. Performance is sluggish compared to the Kindle Basic. It is not a major issue but with prolonged use, it is noticeable. PDF support, similar to Kobo, is poor. It is not possible to highlight text and there is no tap to scroll. The need to scroll down manually in landscape mode, something necessary with the six-inch screen, is a problem due to the device’s slow rendering of PDF documents. In the case of Kobo, it is possible to resolve the issue of poor PDF support with KOReader but this option is not available, so far, for Tolino e-readers. If reading PDF documents is necessary then it is a good idea to avoid the larger Tolino Epos. Overall, Tolino’s software is very basic in its features. In reading settings, the options available include setting the number of screen refreshes when reading and installing dictionaries. On paper, the Tolino Page has an E-Ink Carta display. In actual usage, in my view, the Kindle Basic’s E-Ink Pearl screen has better contrast, with darker text. Overall, I liked Tolino’s extensive support for personal documents but bare-bones features, sluggish performance and software bugs means the device is frustrating. If you are looking for a no frills entry-level e-reader that just works then the Kindle Basic remains the best option.